If you have a Dad or husband like mine, then making a card is truly the easy part. It's the gift that always has me fit to be tied. Either they have everything and don't need anything, or what they do want is way out of my price range. So lately, I've found that gift cards are ideal. They can pick out what they want, and if it's a little pricey, well at least I can say I contributed to it! The little toolbelt image from the Boys Will Be Boys set is perfect for my dh. He wears a toolbelt all day in his real job. At home, he's much handier with the remote than with any of the other tools featured but all things considered, this seems like a perfect match for him. I created a simple pocket card with the intent to replicate one of the pockets on a tool belt! 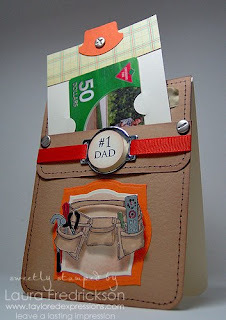 I started with the Father's Day Key Ingredient's Kit, and the tutorial for the pocket card can be found here. The edges were pierced and then faux stitched, then sponged to add to that toolbelt look. The toolbelt image was stamped on Choice Buttercream cardstock and coloured it with SU! markers and a few highlights were added with a silver metallic gel pen. I cut the image out and popped it up on a Nestability Labels 3 that I sponged with the die in place to add interest. 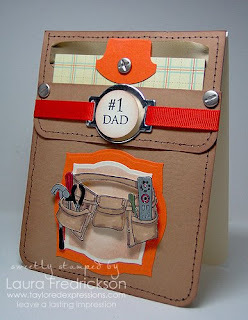 The "Number #1" Dad sentiment was punched out with a circle punch and layered on the metal from the Father's Day Key Ingredients Kit, which had been cut with a Cuttlebug tag die. The orange grosgrain ribbon from the kit is threaded through the metal tag and tucked under the pocket flap. I used the screw-top brads from the kit for "rivets" on the tool belt, and also to secure the tab on the card holder portion. Inside the pocket is the gift card holder. It measures 3 1/2" x 4 3/4" of Choice Buttercream, with a border of the designer paper included with the Father's Day Key Ingredients. The slit punch was used to create the flaps holding the gift card. Also, because I like a card to be able to stand up, I adhered the pocket card to a card base of Choice Buttercream, which is amazingly sturdy and holds the pocket beautifully. My husband is not one for fancy cards, but I think this will hit pretty close to the heart and $50 from Canadian Tire won't hurt either! Thanks for letting me share my little Father's Day project with you, and while you're here, don't miss the opportunity to sign up for the Taylored Expression's newsletter. The link is on the sidebar, and you will never miss a sale or release, not to mention some fabulous design ideas! What a perfect manly gift card holder!!! Love all the faux stitching and sponging. Fab project, Laura! Great use of the hardware! What a fabulous gift card holder! So cute and creative!! Love the hardware too! Fantastic, Laura! Totally flippin' cool!! Laura, this is awesome girl! What a fabulous gift card holder, Laura! I just LOVE it! This gift card holder can be used for any gift giving occasion especially best for wedding card.